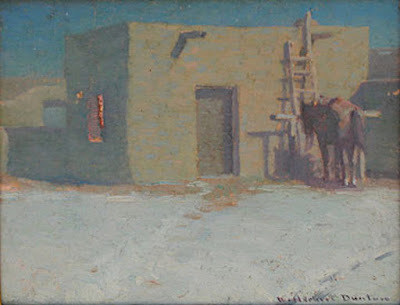 12 ½" x 10 ½"
"Spike and Cow Elk" "Summer Sage"
quiet along its crooked alleys, in the soft shadows of the adobe walls. The mountain rivers sang of happiness. The pines of the peaks breathed a lullaby of sleep." "Between Montana and Mexico unquestionably there are spots as beautiful as Taos . . . .
there was no other place which lent to them so enduring an appeal." gone with the buffalo and the antelope. I'm going to hand down to posterity a bit of the unadulterated real thing..."
He said about Taos, "This is the ideal place for me because there are more varieties of atmosphere than I have found in any other place. . . . There are several varieties of sage and cactus for backgrounds, according to the elevation that you choose. and if one wants to paint a Mexican picture he can get a background almost anywhere near Taos"
Dunton sometimes added "Taos" or "New Mexico" to his signature. Other times he was proud to sign as "Dunton of Taos". Parsons does not offer William Herbert Dunton reproductions, because they can not compare to the real paintings. 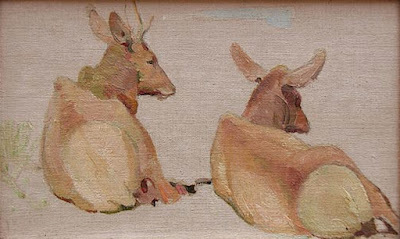 "COMPOSITION FOR 'SUNSET IN THE FOOTHILLS"
"MULE DEER BUCK AND DOE"
"Roping a Wolf (Roping a Lobo)"
"A Lazy Day in Camp" Circa 1916, Oil on Canvas Board, 8" x 10"
"The End of the Day" Circa 1915, Oil on Canvas Board, 12" x 16"
"Delivering the Mail" Circa 1912-15, Oil on Canvas, 30" x 25"
"Pueblo Girl" Lithograph c.1931 14 " x 10.75 "
"Bronco Buster No 9 - Cattle Land Series" circa 1931 16 " x 11"
"Heart of the Wilderness: Elk" c.1933 14.5 " x 10.75"
"The Glance" Oil on Canvas circa 1907 28.75 " x 19"
"The Mountain Mother, Black Bear and Cubs" lithograph 12 x 10 in. graphic designer, mixed media and mosaic and fresco and paint muralist, and easel painter. Herbert Duntons' media included oil paints, fresco, lithography, mosaic, pen and inks, graphite pencils, watercolors, gouache, and charcoal. North American Pioneers, Horses, mammals, animals, wildlife, wild animals, floral landscapes, mountain views and mountainscapes. Taos and New Mexico Before 1940, Arizona Before 1945, Mexico and Central America. WH Duntons' teachers included Ernest Blumenschein, Frank Vincent DuMond and Joseph DeCamp and Robert Henri. His schools included The Cowles School at Boston and the The Art Students League in in New York. J. H. Sharp, E. I. Couse, E.L.Blumenschein, Bert Phillips, Walter Ufer, Victor Higgins and Kenneth Adams. Dunton created illustrations for almost 50 books. 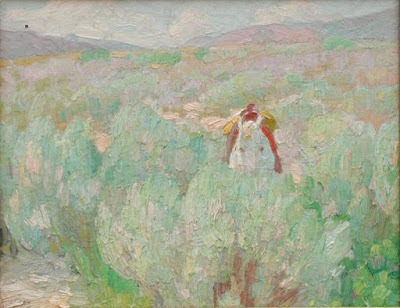 Leon Gaspard was his close friend and teacher, as they both loved the outdoors. Duntons' art works were collected by Douglas Fairbanks, Franklin Roosevelt, and H.J. Lutcher Stark. He born August 28, 1878 in Augusta, Maine. He worked on a ranch in his youth. His grandfather took him to the outofdoors, instructing him in hunting and fishing. By age 12, Dunton was selling drawings to newspapers and to the Boston Sunday Globe. At 14 years old, Dunton was writing and illustrating for Recreation, the sportsman's magazine. Woman's Home Companion, Scribner's, Cosmopolitan and others. 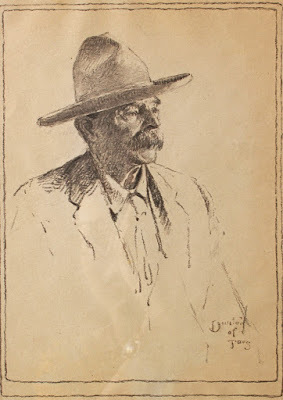 He illustrated many Zane Grey novels. In 1896 at age 18, Herbert Dunton went to Montana and drew big game animals. visiting Wyoming, Colorado, Oregon, New Mexico, Montana, and Mexico. He labored as a ranch hand. He attended Cowles Art School in Boston in 1897. By his twenties he was already a leading illustrator. He studied with Andreas M. Andersen, William L. Taylor, and Joseph Rodefer DeCamp and EL Blumenschein. He was married in 1900, to Nellie Hartley, who gave him two children. He moved to New York in 1903. In 1908 he was elected to the Salmagundi Club. Joseph de Camp and Ernest Blumenschein, who invited him to Taos. Dunton's teachers included Robert Henri. He was a member of the Salmagundi Club and John D. Rockefeller, Teddy Roosevelt, and Douglas Fairbanks were his clients. started a studio and then moved there permanently in 1921. He was the second artist after Bert Geer Phillips to take up full time Taos residency. 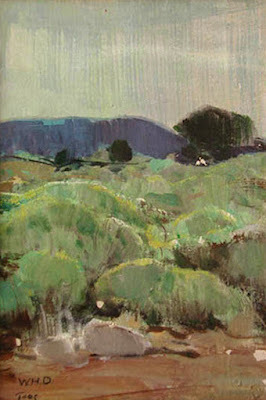 In Taos, Dunton illustrated for Harper's and Scribner's. He created Zane Grey book covers. He created lithographs of animals. 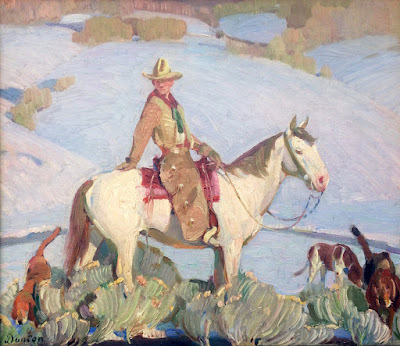 In 1913 he painted Frank Riley, Puma County Arizona sheriff. one of the founders of the Taos Society of Artists. 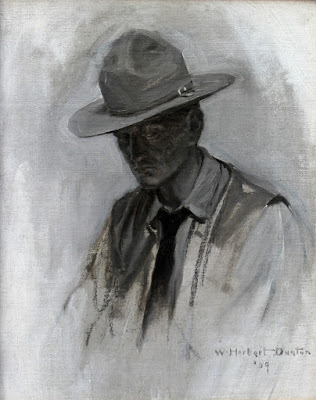 In 1921 he painted the portrait of Ben Lily, as commissioned by W.H. 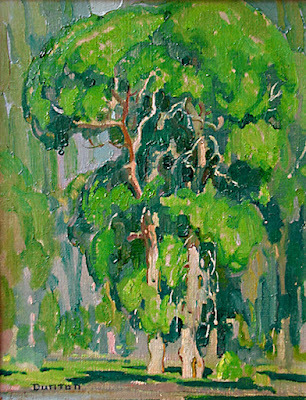 McFadden, and exhibited at the National Academy of Design. 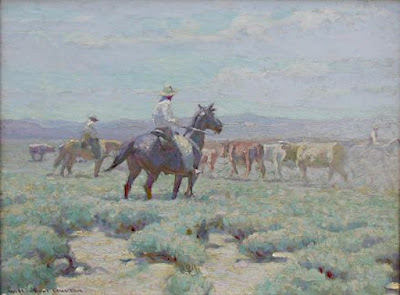 In 1922 he penned "Painters of Taos" for the American Magazine of Art. He taught the advantages of light, color, and Indian Life and Western Life. 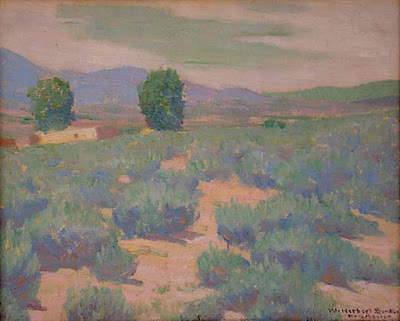 He helped found the Taos Society of Artists, to aid in painting sales. although he continued to work with the group. In 1923 he painted three murals for the Missouri State Capitol. During the depression, he created portraits and lithographs of animals, to sell inexpensive art works. In 1928 his health began to deteriorate, with continuing ulcers as a result of a horse accident. In 1935 he was found to have prostrate cancer. 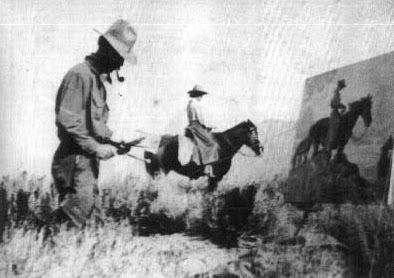 Buck Dunton died in Taos March 18, 1936, at the age of 57. "This is the ideal place for me because there are more varieties of atmosphere than I have found in any other place. . . ."